DownEast Engraving is the leader in sports awards for southern Maine! One trophy, team trophies or the whole league. No order is too large or small! We use only the finest quality components and include team name, league name and individual names at no additional charge. Team or league logos will be included if you provide us with a digital file. We carry a wide range of trophy figures that represent all kinds of sports, academics, achievements and everything imaginable - we can also make custom figure tops for non-traditional events. 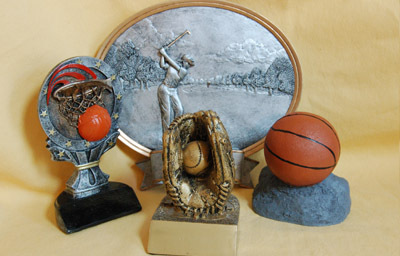 Cast resin trophies are the latest designs and are one of our most popular selling lines. 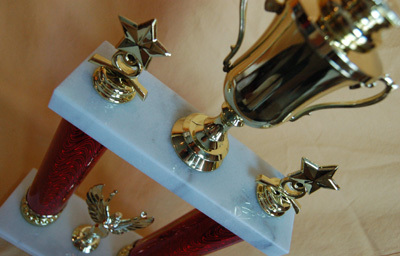 The details, color selections and modern look are not available with the standard gold or silver plastic trophy figures.